How do I know if the hospital where I was treated is reputable or if it has a history of Missouri medical malpractice? Hospital and doctor rankings and awards are available to the public. If the hospital where you were treated has won any awards for high quality, you can bet they will proudly have those awards exhibited in the building and noted online. Asking your primary care physician or a friend who is a medical professional may give you a better picture of the inner workings and care at a specific hospital. A Missouri medical malpractice lawyer can also tell you whether a particular hospital seems to have an unusually good or bad reputation. A hospital with numerous malpractice lawsuits against it may not be your best choice. Of course, even a reputable doctor at a well-acclaimed hospital may make a big mistake that leads you on the painful and time-consuming road to a Missouri malpractice claim. 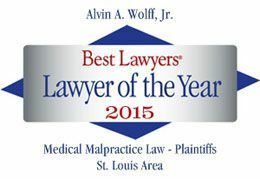 Experienced St. Louis medical malpractice attorney Alvin Wolff is currently negotiating on behalf of a patient whose botched brain surgery cost her the ability to talk and walk. The hospital has already admitted that one of its surgeons performed surgery on the wrong side of the woman's brain, causing her additional damage. Yet that hospital—SSM Health Care—is acclaimed for its high quality and standards, and the surgeon has what experts in the field say is a pretty clean record. Whether the hospital or doctor has a good reputation or a bad one does not make a difference when a serious mistake has harmed a patient. To see how we can help you, call Alvin Wolff at 314-241-2500.